I remember coming to Fort Henry as a child – back then walking over the draw bridge and entering the Fort was like entering a story book. I was old enough to know it wasn’t real of course, but the soldiers of the Fort Henry Guard marching on the square really brought the characters to life. 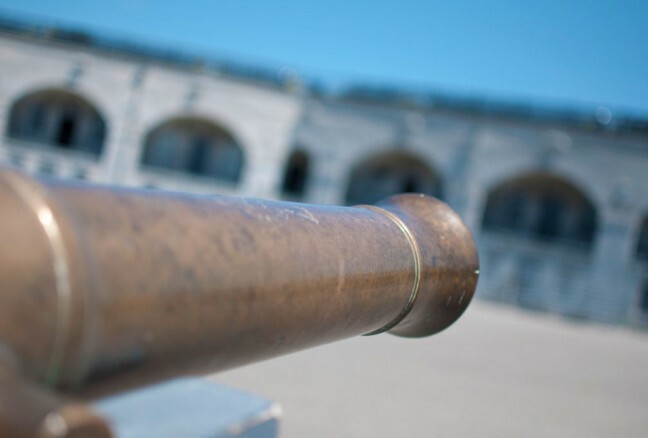 In the 1800’s Fort Henry, along with Kingston’s Martello towers, served to protect Kingston and the St. Lawrence River shipping route from invading forces. Since the 1800’s the Fort has been restored to it’s original glory and now operates as a living museum. The Fort was designated as a National Historic Site of Canada in 1923. I got the opportunity see the Fort through the eyes of a kid again when I went with my friend Jacklyn and her family. 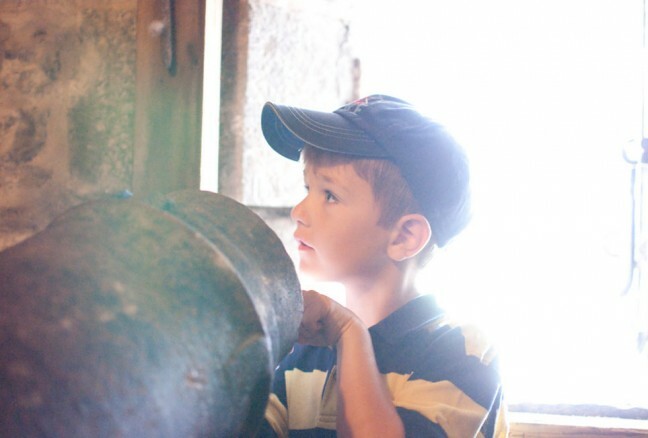 6 year-old Will figuring out the ins and outs of the reverse facing cannons at Fort Henry. A 1800s-era cannon defends against the imaginary invading forces at Fort Henry – Kingston’s living military museum. 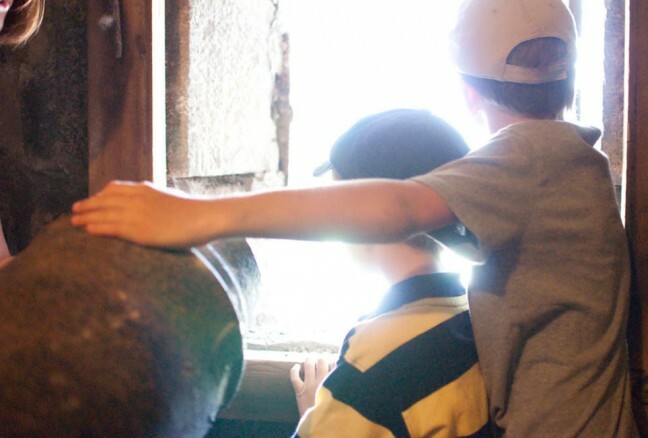 Will, 6 years old, and Tom, 8 years old, join their parents to step back in time to experience 1800s-era military life in Kingston’s living military museum – Fort Henry. When we arrived at the Fort we were beckoned by one of the Fort Henry Guard. He explained to our group that he was a soldier in Fort Henry and would like to take us on a tour. As we stood between the Fort’s two walls he explained that we were standing in the Fort’s dry moat. Being in Canada a dry moat was preferred because in winter the attacking army would simply be able to walk across the frozen water! Since this area was surrounded by loop holes (small windows that the soldiers could fire rifles through) and cannons, this would be the most dangerous place to be – if we were invading troops! 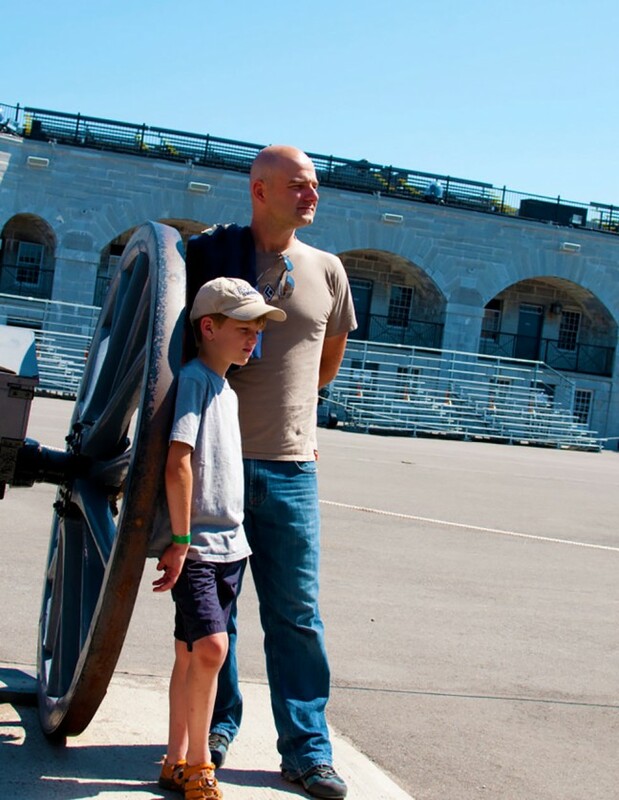 8 year-old Tom and dad, Chris, contemplate how tough military life was in the 1800s. We continued on and our tour guide taught us about his daily life in the Fort. At Fort Henry, the soldiers would actually purchase their rank since it was assumed wealthy men were also educated. The low ranking soldiers made pennies a day so they had almost no chance of moving up the ranks. Tom, Jacklyn’s 8 year old – being just as inquisitive as I was as a child – asked why they simply didn’t save their pennies to move up the ranks. As it turns out the soldiers were required to purchase their own furniture, food and beer so it was impossible to save any money. 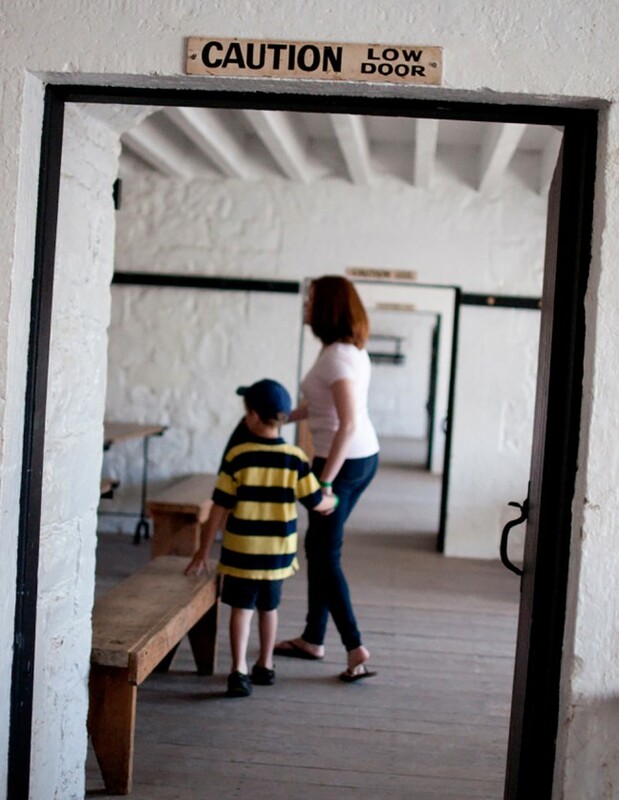 6 year-old Will and mom, Jacklyn, explore the family quarters and school house in Fort Henry. We scoped out the privies and the restored rooms of the officers. Our guide pointed out a number of ingenious collapsible furniture pieces the officers owned since they were required to move fairly often. We also saw the restored lounge where the officers could entertain their wives visiting from the city. I suppose if the officers were rich enough to purchase their rank they could also buy a house for their wife and children in Kingston. 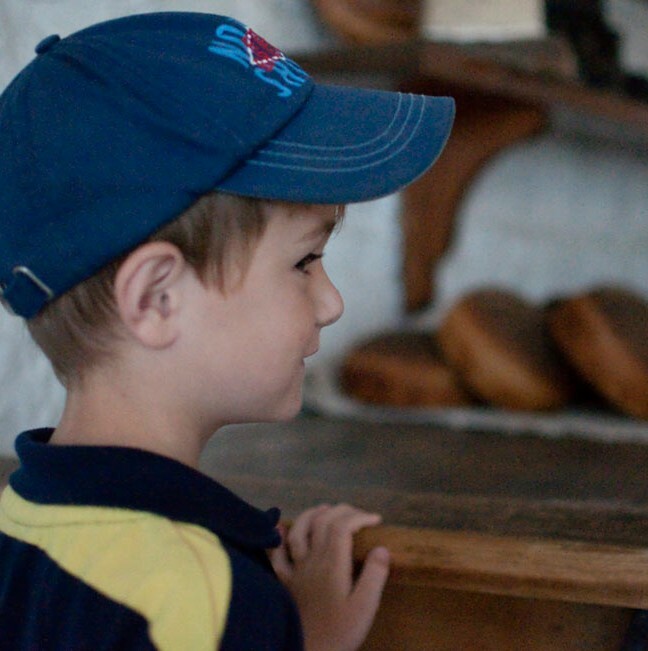 6 year-old Will salivates over the freshly-baked bread in Fort Henry’s original bakery. We continued on to the married quarters since – as it turns out – there were families living in the Fort as well. The Fort even boasts a school hall to teach the children until they’re old enough to either become a soldier. The Fort also has its own kitchen complete with multiple bread ovens. While we were there the resident baker was just finishing a batch of bread using only equipment available in the 1800’s. Enjoying the hot-out-of-the-oven bread from Fort Henry’s bakery for our snack break. Our hour-long tour flew by and before we knew it, it was time for a snack break. 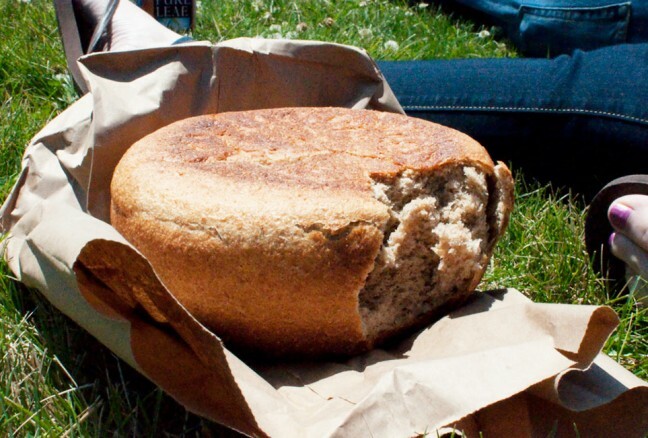 We went straight for the bread baked in Fort Henry’s own historic bakery. The bread was still warm from the stone oven. We rounded out our visit by exploring the secret passageways of the reverse firing chambers. The kids loved running through the halls and imagining they were soldiers at the Fort. Soon it was time to hang up our red coats and put our imaginary lives as 1800’s soldiers aside and return to the real world. It was fun to escape it for a while though! 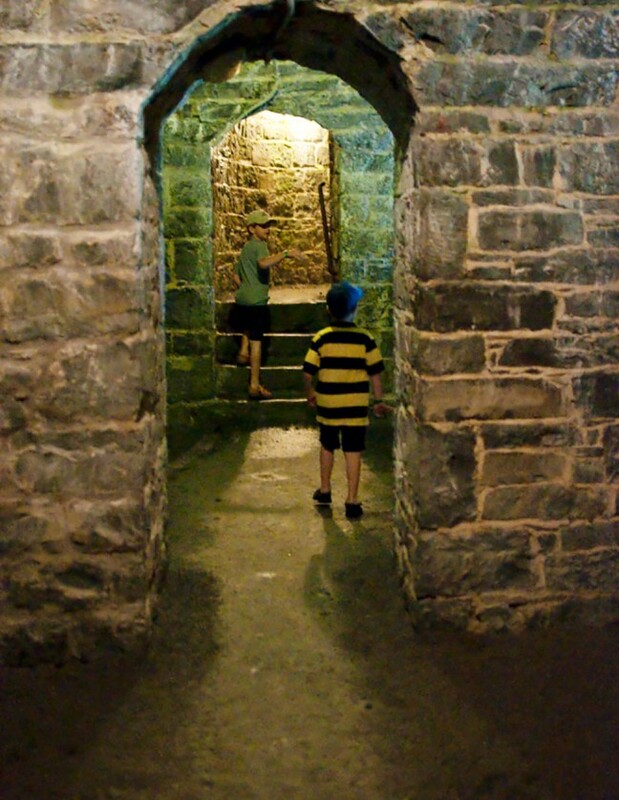 Will and Tom pretending to be members of the Fort Henry Guard as they explore the secret passages of the Fort. 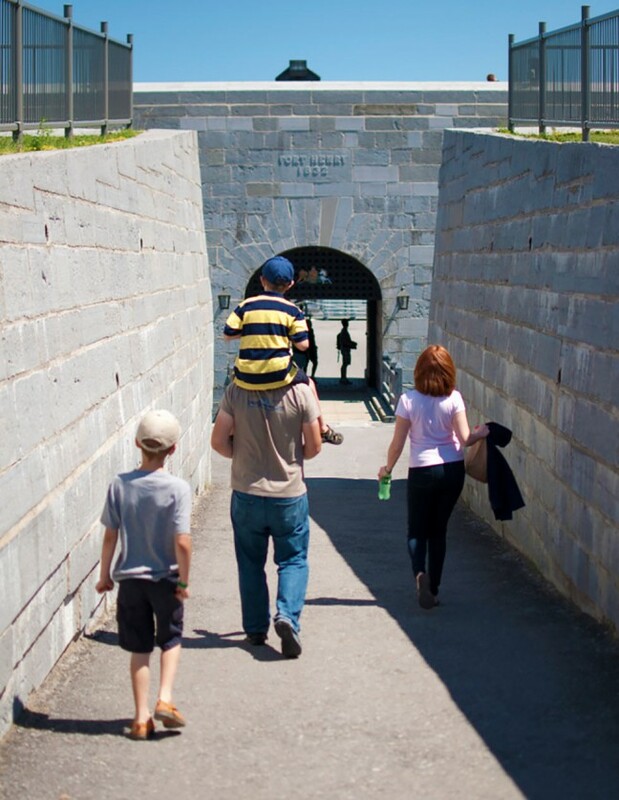 Fort Henry is open from 9:30am to 5pm every day during the summer. 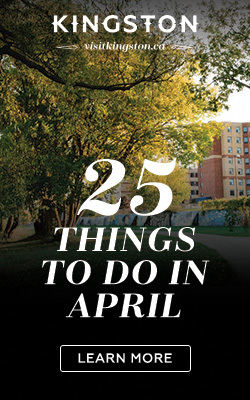 Tickets are available for $17 for adults, $14 for kids and free for toddlers. The Fort also hosts Sunset Ceremonies on Wednesdays and Saturdays at 8pm featuring a full military re-enactment with the option of a dining package. 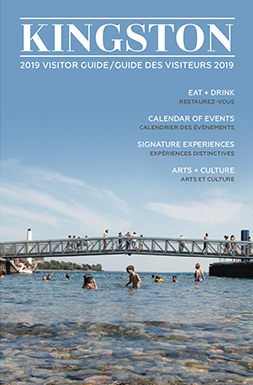 The Fort also features a patio restaurant overlooking Lake Ontario – the Battery Bistro which is within the Fort but open to the public from 11:30am to 9 pm. Will and Tom peering out the windows of the reverse battery at Fort Henry.